This cake is the happy result of an experiment in gluten-free baking* for my Lovely Flatmate, who is gluten-intolerant, but lacks the willpower to resist my baked goods. It’s based loosely on a Greek cake called Revani, which traditionally is made of a mixture of semolina and almond flour, and sweetened with a sticky orange syrup. 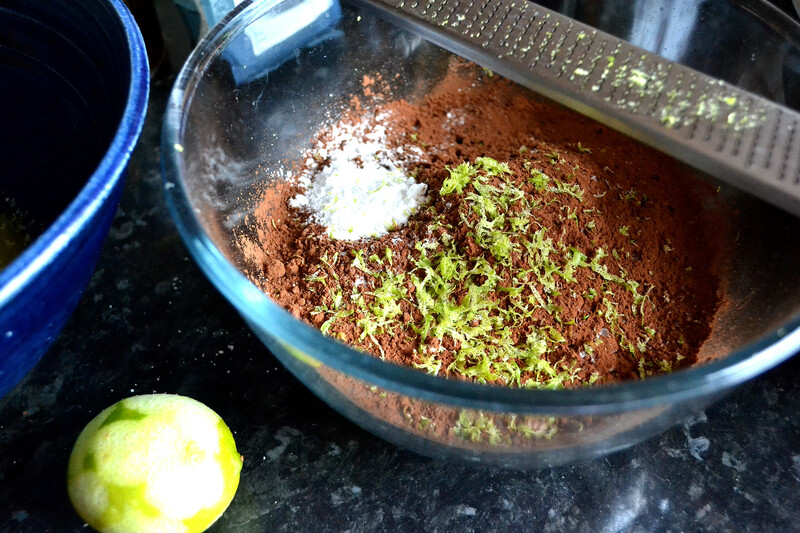 My version substitutes lime for the orange and adds plenty of cocoa. It’s a delightful crumbly-but-moist tea cake, with a hint of crunch from the semolina. It meets my ‘specialty diet’ test, meaning that I would bake this cake again for people without dietary restrictions. Lovely Flatmate consumed the entire cake in two days (hurrah! Also, slightly alarming). This cake is also something of a cautionary tale. I’ve managed to largely resist the urge to buy cute china and utensils, rattan mats and distressed wooden boards that I use only for food photography, although this possibly is because my budget doesn’t allow for them. I do devote time and attention to the photos on my blog; if the food doesn’t look like it tastes good, why would anyone want to cook it? Nevertheless, I’ve not been entirely immune to the ferocious lure of competitive food styling. Which is how, having reached a near-hallucinatory state some 20 or so photos in, I found myself asking, “why am I sprinkling cocoa powder on my counter?” A reminder, I suppose, to keep it real. * Although semolina flour has a lower gluten content than wheat flour, it is not actually gluten free. So it would not be suitable for people with coeliac disease or serious gluten intolerance. These people should use a gluten-free substitute for the semolina, such as polenta flour. ** The measurements below are in US cups; I kept a careful record of metric weights but my computer crashed, and I couldn’t recall all of them. Here is a link to a conversion chart, which includes most of these ingredients, with my apologies. Note: you can increase the amount of cocoa and decrease the sugar if you want a more bitter cake. Preheat your oven to 180 degrees Celsius (350 degrees Fahrenheit) and butter a springform cake pan. Combine the semolina, almond flour, salt, baking powder, and lime zest in a mixing bowl. 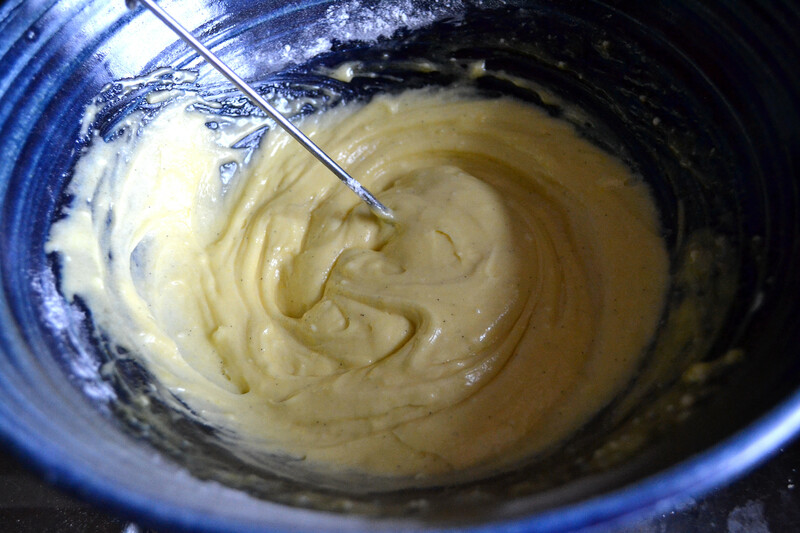 In another bowl, beat together the egg yolks, vanilla paste, melted butter, and confectioner’s sugar. It will have the consistency of thick custard. Beat the egg whites in a clean bowl using clean beaters until they are creamy. Slowly add the caster sugar, and continue to beat until the egg whites are stiff. Using a rubber spatula, fold the egg yolk mixture and 1/3 of the egg whites into the dry ingredients. Then fold in the remaining egg whites, being careful not to overmix. Pour into your prepared cake pan and bake for 40-50 minutes, or until a wooden pick inserted in the cake comes out dry. While the cake is baking, combine the lime juice and confectioner’s sugar in a saucepan and heat over medium-low heat until the syrup is bubbling and thickened. As soon as the cake is done, gently run a knife around the edge and loosen and remove the spring form side. 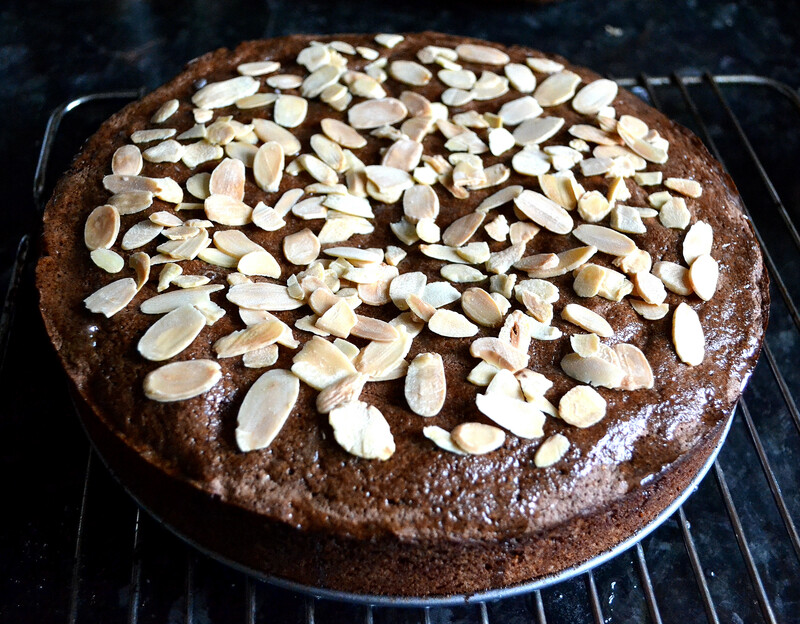 Pour the syrup over the top of the cake, then sprinkle with the flaked almonds. Cool completely before serving. 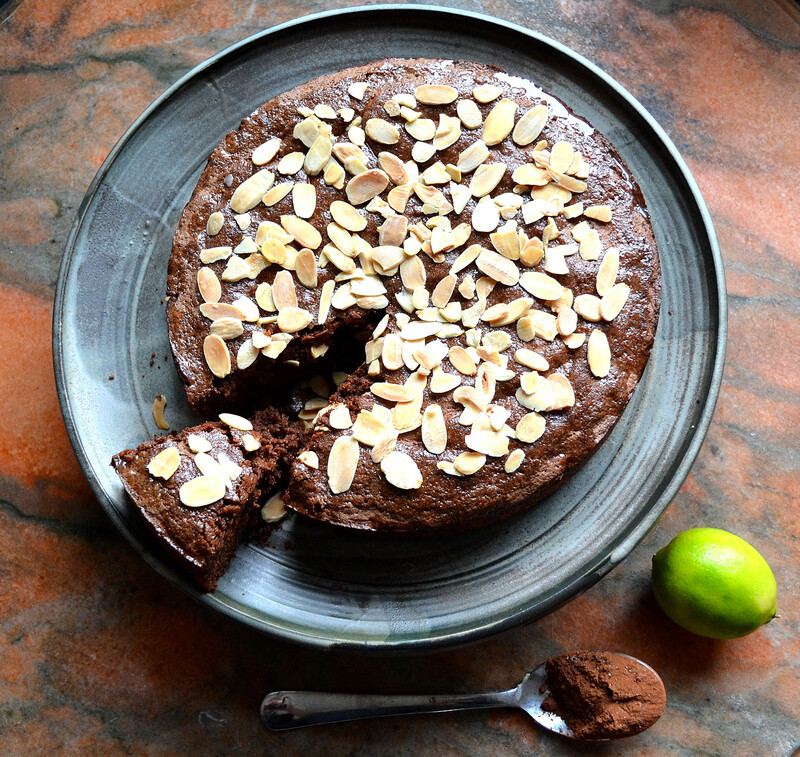 This entry was posted in Desserts and Sweets, Recipes and tagged almonds, Baking, Cake, Chocolate, dessert, Easy, gluten-free, lime, Photography, Quick by Susan. Bookmark the permalink. 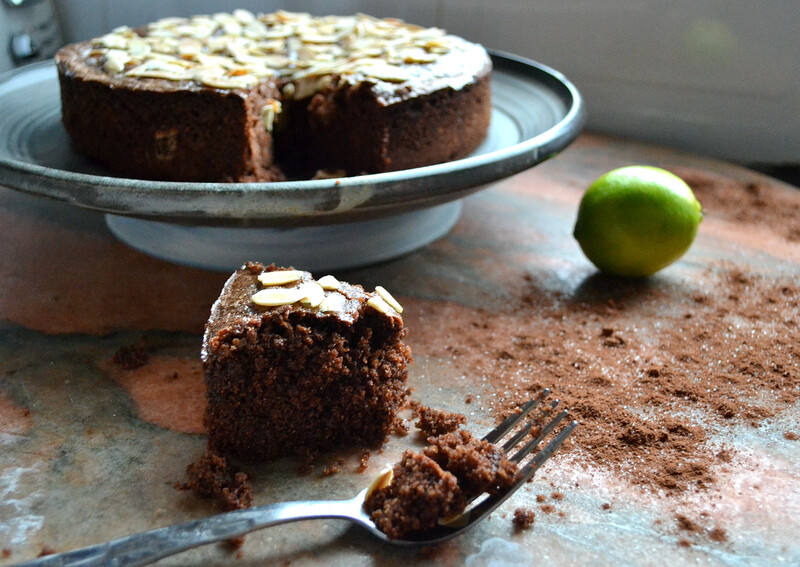 That’s an interesting combination – chocolate and lime – and the cake looks delicious!! The flavour combination works, actually. I love citrus and chocolate. This looks delicious and your photos are beautiful. I love all your recipes and blog posts and this one looks great. Just wanted to let you know however that semolina is not gluten free! So it might be okay for gluten-intolerant people who are not very sensitive but wouldn’t be okay for sensitive people or coeliacs. It might be worth putting a note in the recipe so that no one gets fed it by mistake and gets ill. I’ll still be trying the cake but will try a regular gf flour mix instead. Oh wow! Thank you — I didn’t know that. I will make the appropriate changes. Again, many thanks. And let me know how the recipe turns out! This looks amazing! I can’t believe that it is gluten-free! I can also understand the food styling bug. I confessed to sketching out what I want my shots to look like before I am even done cooking and my friend looked at me like I was insane! Not sure! Do you sketch yours out? Wow this is awesome really ! I totally love it !